for $189,700 with 2 bedrooms and 2 full baths. This 1,012 square foot home was built in 1985 on a lot size of 0.23 Acre(s). 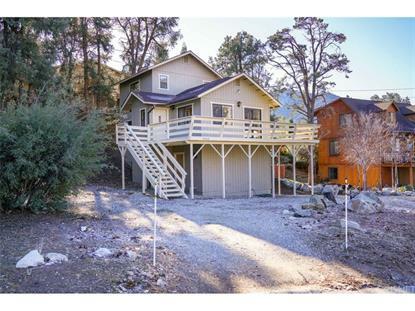 Cute cabin in turn-key condition-perfect for a weekend getaway or full-time living. Open floor plan: Kitchen w/breakfast bar & plenty of cabinet & counter space, Living room features vaulted pine ceilings, knotty pine walls, laminate flooring with sliding glass doors that open to a large deck. Good sized bedrooms: entry level master bedroom & full bath, spiral staircase to the upper level 2nd master bedroom with a 3/4 bath. Closet at entry is large enough tomlm plumb for a stackable washer & dryer. Expansive mountain & forest views. Home is located on a quiet cul-de-sac. There is a vacant lot directly across the street & above other houses on the opposite side of the street creating an added sense of privacy. Large crawl space below with tons of storage space. Easy access with plenty of parking. Great price for this mountain cabin! **wood-burning stove will be removed prior to close of escrow.